FlossieBlossoms: It's been a busy week, lots of sewing projects finished! It's been a busy week, lots of sewing projects finished! I've been sewing a lot this week. 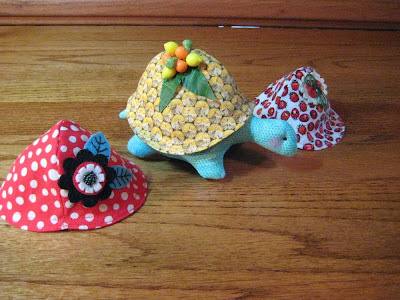 I was in a pincushion swap and I decided to sweeten the pot a bit by making a few extra shells for the turtle. I particularly like the Carmen Miranda/fruity one! It's on its way to somewhere, I think my partner will like her. 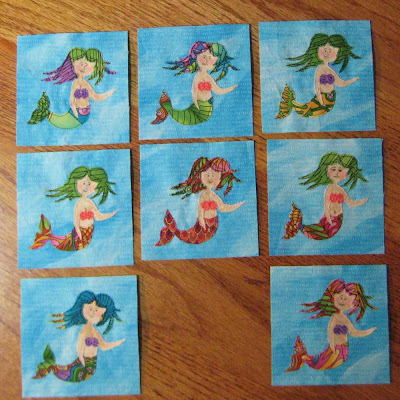 I finished the mermaids and all the pineapple drinks, too and got them all mailed out for beach/underwater July/Aug 3.5" mini block swap. Sorry about the blurry photo, but you get the drift, right? 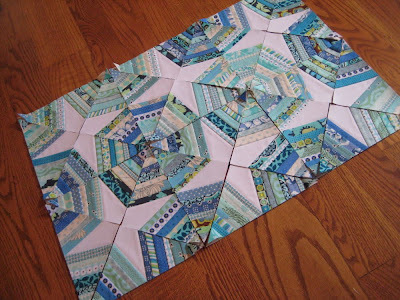 I got all the blocks done for the DQS9 doll quilt, I still have to put them together and then quilt it, but the hardest part is done, I think. 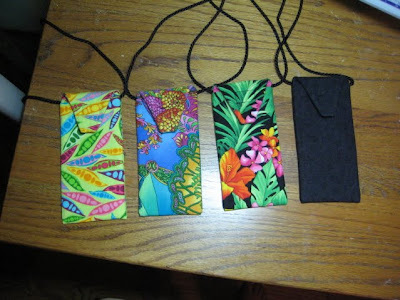 And I made 4 little eyeglass purses for a friend, she keeps her reading glasses in them and hangs them around her neck. She needed one black one for dressy occasions and then some fun bright ones to wear to work. I got those done today. 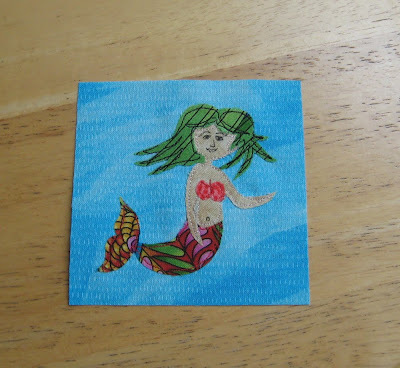 And, for another swap, a "flat pet" that can be taken out and about and photographed in fun places.... I made a flamingo (no!) and have it ready to mail off to parts unknown (to you, I know where she's going). I have one other swap to fulfill and then I'm done for a while, phew! 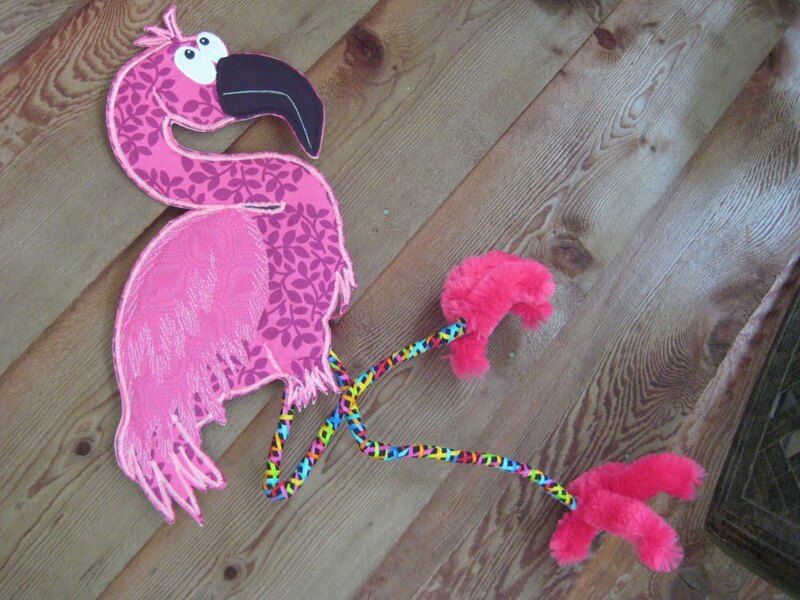 The feet are made from over-sized, enormous chenille stems, aren't they wild?! She looked pretty cute on our verandah, it's going to be hard to send her away! That's what I've been up to! What about you? OOOOOoooooooh... I love EVERYTHING Sooz.... That cute cute turtle and wow making extra shells...The mermaids are cute and yes I get the 'drift' (nice pun!) I totally hope you are my DQS9 partner! 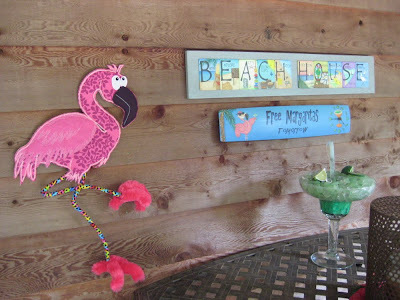 soooo nice and that Flamingo... Oh my... adore his furry feet... Such cute pals are being create... I am kicking myself for having to stay at the sidelines but I am really really overrun at the moment and can't so wonderful to see your super creation!! Wow!! So many wonderful projects. I love, love the turtle. I gotta get that pattern. It's so cute! I also love your Mermaids and spiderweb blocks. The flamingo is just adorable. Just made me smile. Love it!!! I love your turtle ! And different "dresses", how cute. So typically YOU to send extra shells along with the turtle.....and the flamingo......soooooo cute and again, soooo YOU! Love your sense of humor, honey! Wish I was in that "critter" swap......next time!